This was a jam packed weekend for CloudShare. Many of the ProPlus team attended Silicon Valley SharePoint Saturday and it’s a release weekend. This week we are introducing more templates, a search and sort feature in your machine list, and new options for accessing technical support. Vanity URLs are also on their way, but we’re keeping you waiting until Tuesday morning for those! MORE, MORE, I WANT MORE! More what? Templates! Lydia and team is working hard to bring as many new templates to you as possible in an effort to cure template rage. We have 5 new templates for this release. In addition, we have created some new versions of the Windows templates with Visual Studio and Office. These are excellent templates for a quick start to general development and testing. These come with Windows, Visual Studio 2010, Office 2010, and the standard bits pre-installed in both 64-bit and 32-bit versions. With a plethora of new template offerings, we had to make it easier for you to actually find what you need. We now have a “search and sort” feature for the machine template list. This allows you to search for templates, group them by category, and even filter for the most popular. The search and sort functionality is available when you add a new machine to your environments. 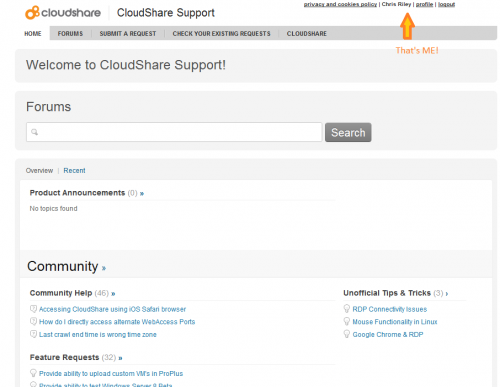 Finally, we have simplified how you access support in ProPlus. There is now a “Help” option on the left, which gives you quick access to the new help desk, and “single sign-on” to our help desk via the “Support Tab” in the application.